For this week’s Retro Recipe, I decided to try an old reliable cookbook, one that’s been on America’s shelves since 1963: Betty Crocker’s Cooky Book. Long the go-to tome for busy moms in need of a sugar fix for kids, this cookbook features classic cookie recipes we all know and love, plus some that are a little more, shall we say, out there. Chocolate Chips I understand, but Prune Lemonade Bars? Out of all the cookies in this book (and there’s 450 of them, all illustrated in vibrant Technicolor photos), I figured these bars would be the best test to see how well Betty’s kitchen held up. If Prune Lemonade Bars can still throw down, even 50 years later, then this is truly a vintage cookbook worth its salt. If Sara Lee, Duncan Hines, and the Entenmann clan are American baked goods royalty, surely Betty Crocker is the true empress. But while Sara, Duncan, and Mrs. Entenmann were all real people, Betty Crocker was a marketing ploy thought up in the 1920s by a Minneapolis advertising firm. To promote General Mills’ Gold Medal Flour, the Washburn Crosby Company released an ad on the back of The Saturday Evening Post for a then-popular “premium” prize. Just complete a simple puzzle, send it in to Gold Medal, and you’d receive a free pincushion. The contest was easy enough, but the ad men were shocked to find that, along with the puzzle solutions, housewives sent in thousands of baking questions. How to bake the best bread, what temperature was best for cookies, the ins and outs of sifting: clearly ladies were in desperate need of kitchen guidance. So the ad team created “Betty Crocker” as a way to reply to the questions and put a human face on General Mills. A contest was held amongst the firm’s female employees for Betty’s signature, her last name was taken from a beloved former Washburn Crosby executive, and artist Neysa McMein was hired to paint her portrait. 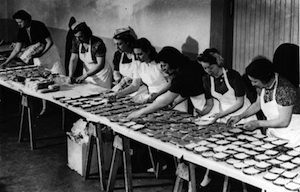 Betty Crocker’s corner on the cookbook market started off simply enough, with color pamphlets about baking and the like, but by 1950 she’d branched off with the first edition of her Picture Cookbook. The Cooky Book appeared in 1963, featuring large sections on Holiday Cookies, Heritage Cookies, and Quick and Easy Cookies for moms on the go. I found the Prune Lemonade Bars were in the Classic Cooky section, although I’m not entirely sure what makes them such classics. 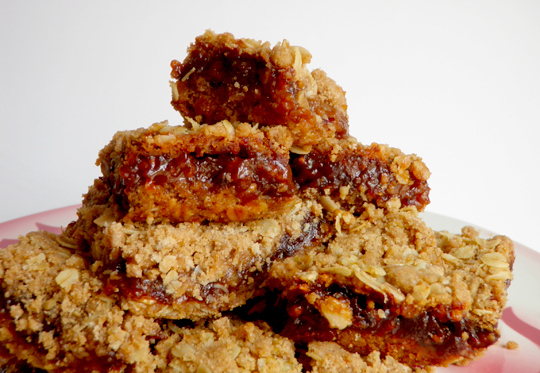 The recipe is simple enough: an oat crumble crust on the bottom, spread with the prune-lemonade mixture, then topped off with more of the crumble, lightly packed. 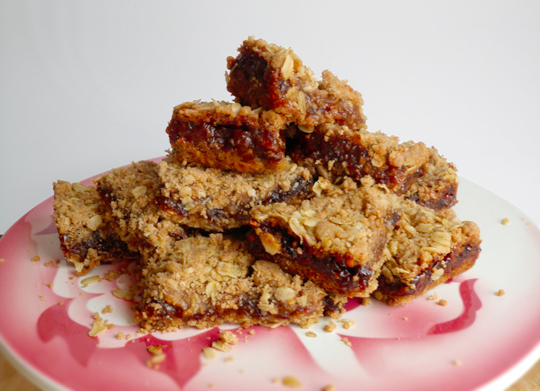 It read like a trusty fruit bar with an interesting twist, plus the prunes and oats made me feel a bit healthier. I went down to the corner store to pick up some prunes, and began work on my project. The recipe calls for the prunes to be chopped finely, then cooked with a can of frozen lemonade, plus a can’s worth of water, until syrupy. Once the prune mixture started to bubble and thicken, I got flashbacks to the Hot Raisin Sauce that topped my Ham Logs from a while back. That musty, sour smell made me panic, but when I tasted the sauce I was reassured. Somehow the frozen lemonade actually did taste just like lemonade, and the prunes were sweet and melty and not at all bad tasting. 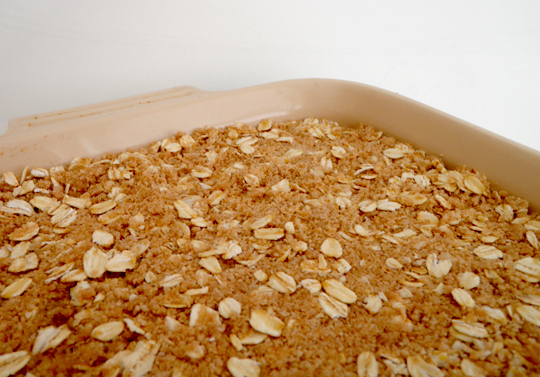 The oat crust was a breeze to prepare, its shortening and butter creamed with brown sugar, plus flour and salt, then the oats mixed in to finish. I tasted that, too, and it was so good I think I’ve found a new crumb topping recipe — normally I use white sugar in crisps and crumbles, but the brown sugar gave it a nice flavor. I let the prune topping cool briefly before pouring it into a baking dish over my crumbs, packing more crumbs on top, and putting the whole thing into a 400 oven for 25 minutes. It looked much the same after I’d taken it out as it did before it was baked. No bubbles, just a nicely browned oat crust. The book recommends cutting the bars while still warm, but I didn’t have good luck with them staying together, so I think you should wait until they cool. That is, you should wait until they cool if you can hold yourself back from the delicious awesome power of the Prune Lemonade Bars. Any doubts that Betty’s cookies would not hold up were dispelled with the first bite of these beauties. I’d compare them to a homemade Fig Newton, but with much more personality and crunch. The prune/lemonade mixture was inspired, too. The prunes were sweet and sticky, and the lemonade was just tart enough to give the whole thing some edge. And yes, to answer your question, I did indeed eat them for breakfast. This is a multipurpose bar, people. Add some vanilla ice cream and you’ve got dessert, but with a cup of coffee and some plain yogurt you’ve got a darned fine way to start your day. So keep on keeping on, Betty. You haven’t lost your touch, even after all these years. Simmer 2 cups very finely chopped uncooked prunes in 1 can frozen lemonade and 1 lemonade can of water in covered saucepan until soft, about 15 minutes. Blend in 2/3 cup of sugar, 1/4 cup of flour, and 1/4 t of salt. Add 1/2 cup chopped nuts. Cool. Heat oven to 400. Mix shortening and sugar thouroughly. Stir flour, soda, and salt together, blend in. 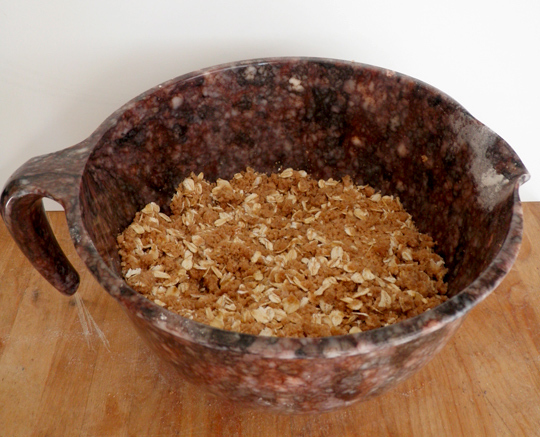 Mix in rolled oats. Press and flatten half of mixture over bottom of greased oblong pan, 13x9. Spread with cooled filling, top with remaining crumb mixture, patting lightly. Bake 25-30 minutes, or until lightly browned. While warm, cut into bars and remove from pan. Makes about 2 1/2 dozen bars. Ooh, I wasn't sure at first but after reading the recipe I definitely want to try them! frozen lemonade and prunes? I don't know. But your photos make it look mighty tasty. I find it helpful to repeat "prunes are just dried plums" over and over. Otherwise I feel like an old lady with gastrointestinal issues. Wow, a complete success! Congrats my dear! Although, in some ways i enjoy the gag-reflex-inducing failures most of all. My mom used to put these in my lunch box! She got around the prune issue by telling me that the filling "is something like a big, big raisin, honey." A recipe I'd love to see here is one for that lemon pudding thing that separates into curd and cake while it's baking. Am I the only one who remembers it? You are not alone - Baked Lemon Cups are, hands down, the Best Dessert Ever. There is a recipe for them at http://www.recipezaar.com/Lemon-Cups-114191. My recipe is similar, except it calls for scaldong the milk and letting it cool, and you don't grease the custard cups. I saw a similar recipe once, using chocolate, called Chocolate Pudding-cake, and it was very good. But lemon is clearly superior. Robyn: I don't know that cake, but I did a quick internet search and it certainly seems like it would be tasty, and really simple to make. I'll do some more research and see it it's Retro Recipe worthy. Thanks for the tip! Sounds delish... I will have to try these when I am not on a nonsugar diet. YUm, thanks for sharing. Thanks for the history of Betty Crocker! Prunes have been getting a make-over. They are now called "dried plums." I think Dried Plum Lemonade Bars sounds more new century.